It was our last 2 days in Norway and we sailed up the famous and remote Lysefjord with its iconic towering sides. Sailing back down the fjord we spotted a tiny orange object on the shore. Two young German adventures had got themselves stranded on a small rock with nowhere to go! 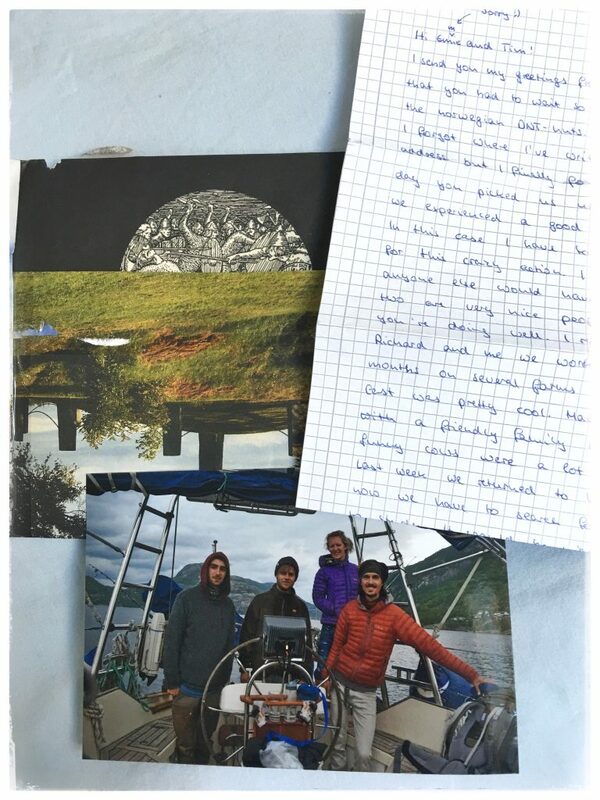 A full year after returning from Norway we received a lovely letter in the post. It was from the two young Germans that we rescued! 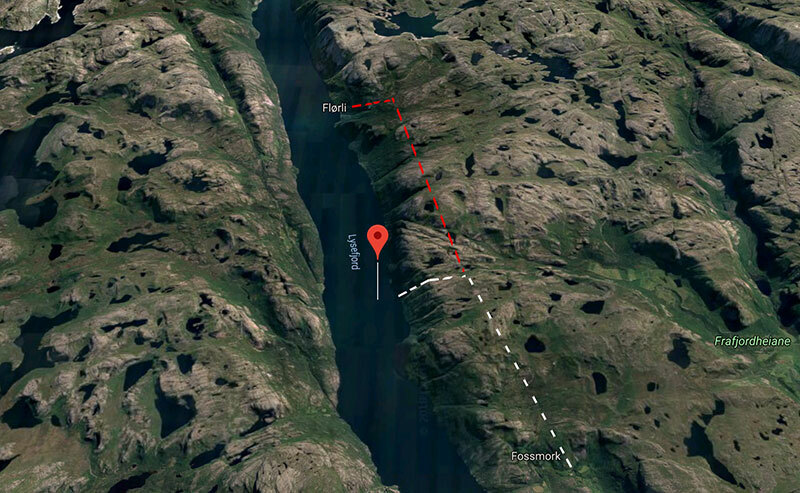 They had been trekking on unmarked routes in an attempt to reach Flørli, a small village reached only by boat. They had no GPS or maps and descended down to the shore about 5 miles too early. They realised it was the wrong way after climbing down steep ravines and having to abseil in parts. After a short while they realised their mistake but there was no way to return the way the came. Below the map shows in White the route they took whilst in Red was the intended route. The sides of Lysefjord are impossibly steep . End to end, it measures 42 km(26 mi) with rocky walls falling nearly vertically over 1,000 metres (3,300 ft) into the water. Lysefjord was our last mini trip before heading back to UK and we spent time at Flørli preparing the boat, which included decommissioning the inflatable dingy. Once ready we sailed down the Fjord in strengthening winds when Tim spotted a small orange spec on the shore. The Fjord itself is quite wide, so spotting people from one side to the other would be impossible. The orange spec was in fact the rain cover of their rucksacks that they waved frantically at the very occasional passing boat. Until then their attempts has been futile. Emmie stowed the sails and we used the engine to get closer. Two young Germans stood upon a small rock on the shoreline. Each side was thick forest leading up to vertical cliffs. After a few minutes we decided the only option was for them to swim to the boat. Better that than spend the next 2 hours recommissioning the dingy. However, whilst the two half naked Germans stood on their little rock ready to swim, we remembered that we had a set of ladders that clip onto the bow (front of the boat). The bow on Shadowfax is of a classic design and overhangs the water by a meter or so. This meant we could very carefully bring the boat close to the end of the shore allowing them to climb onto the ladders without the boat crashing into the rock! It was a delicate exercise which took 4 attempts to get them and their bags on board safely. Within 30 minutes they had gone from quite a serious situation to drinking tea and biscuits on board a yacht! We then dropped them off at a village near the mouth of the Fjord. You could be forgiven to think I exaggerate when I say their situation was serious. However, we saw very few boats and those that we did see were on the other side of the Fjord since this was the most direct route and arguably the most beautiful, where the famous Lysefjord waterfalls descend. It was utter chance we spotted their rucksack cover and we were significantly closer to their side of the Fjord than other boats. What I am suggesting is that they could have easily spent another few days or more on that rock without being spotted. Needless to say, there was no phone reception where they were.